This is one of the finest vintage magazines in our collection. Dating from 1939, not only is it beautifully painted with bright, popping colors, it also features a striking illustration of a woman who looks like the twin sister of the Bride of Frankenstein. 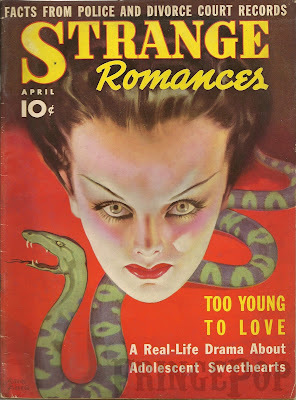 She's so "alive", she looks like she's ready to leap off the cover and stare you down with her penetrating eyes. One word- delicious.